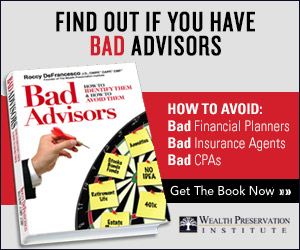 The APS™ not only wants to hear from you one of it’s “rated” advisors, in your opinion, is not living up to the standard of care and ethical benchmarks of the Society, we also want to hear from you when you want to commend a “rated” advisors for quality work done on your behalf. It is important to receive feedback from those who use a “rated” advisor for multiple reasons. 1) Once a year the best asset protection advisors who have been “rated” will be recognized in an official manner by the APS™. The APS™ creates a list of the top 10 asset protection advisors in the country and one of the criteria will be the positive feedback rated advisors receive from their clients and/or fellow advisors. 2) Your feedback about a “rated” advisor will be helpful to the APS™ when determining how to shape its education on an ongoing basis. 3) Your comments will be read by others looking for a “rated” advisor in their local area and therefore, your comments will be helpful to everyone when trying to determine who to use as their “rated” advisor. To submit a comment/commendation about a “rated” advisor you worked with, please create it in Word format and e-mail it to EMAIL US.